The first student residence, at 26 Cornell Road, was rented for $600 per year in 1889. 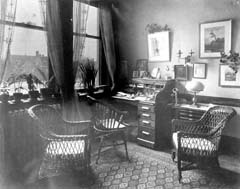 The Advisory Council raised and spent $3,700 for its preparation and first year’s expenses and hired Mrs. William Darrach as house mistress. In 1902, Flora Stone Mather funded construction of Haydn Hall. Originally envisioned as a study and recreation facility for students not residing on campus, the growing student population and crowding at Guilford required that Haydn also serve as the second College for Women dormitory. Again, the Advisory Council, with the help of the Alumnae Association, pledged the estimated $1,600 required to furnish Haydn. 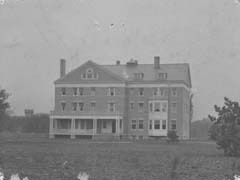 In 1915 Flora Mather House was constructed as the College’s third new dormitory, allowing Haydn to revert to its original planned use. The Alumnae Association provided over 85% of Mather House’s cost. 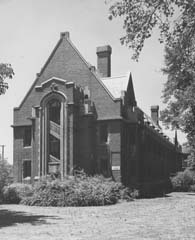 The Advisory Council had sole responsibility for operating the College dormitories until 1929. At that time the University’s Treasurer took responsibility for accounting and, a few years later, for purchasing. But the Advisory Council was still actively engaged in the operation of the dormitories through the 1940s. Each House Committee prepared annual operating budgets, met regularly with the House Mistress, informed itself about the intellectual and social progress of the students, and continued to provide furnishings, equipment, and entertainment. With the post-war baby boom, the university began plans for accommodating a larger college-age population. These plans included new dormitories for men and women. 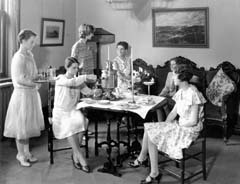 In 1960-1961, the Mather Alumnae Association raised $218,288 ($10,000 from the Advisory Council) to furnish the new dormitories: Cutter House, Smith House, Taft House, Taplin House, and Stone Dining Hall. These residence halls were named for past presidents of the Alumnae Association or members of the Advisory Council. In 1964, the Alumnae Association again sponsored a fundraising campaign to complete construction and furnish new dormitories. 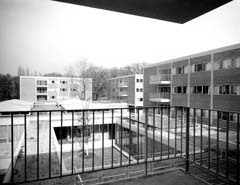 These dorms included Tyler House, Raymond House, Norton House, Sherman House and Wade Commons. These residence halls were all named for members of the Advisory Council.